When I was young, I kept a journal. In it, I wrote about all of the private thoughts, fears, and feelings that I felt I couldn’t tell anyone. Well, that was the general idea. By "kept a journal", I really mean I wrote in it for about a week, rediscovered it a month later, wrote in it once more and then forgot about it for another three months. I was never very good with writing things with paper and pen. My love of writing only flourished when I was first introduced to computers. Fast forward to the present. Sometimes there things we feel the need to write about that we just can’t blog about. Perhaps family members read your blog or perhaps the issue crosses a TMI boundary. However, despite these misgivings, there might still be an urge to write about it, just not in a public manner. After all, writing is a very good way of organizing your thoughts on matters. At one time, I considered setting up a private WordPress blog for my son for this very purpose. He could use it to express his thoughts on anything and everything. The posts would not be publicly visible. After all, he’s only 8 and doesn’t need a public blog. However, B and I would be able to read it. I actually got it all set up, but never showed him it. Perhaps when he’s older he’ll use it. As for me, I’m thinking of setting up a private blog for some of my thoughts. They might be matters that I don’t feel comfortable shouting out to a random mix of strangers, friends and family. They might be matters that I feel don’t interest my TechyDad.com audience (or my Twitter or Google+ followers). Or perhaps it is something that has been on my mind that might be a blog post at some point, but hasn’t been fully fleshed out yet. In any event, it would be nice to have a place to record my thoughts privately and a non-public blog seems ideal. 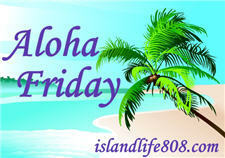 My Aloha Friday question for today is: Have you ever had a journal or a private blog to record your thoughts? P.S. If you haven’t already, go visit FollowerHQ and let me know what you think of my Twitter application. P.P.S. For a bit of fun, try my other Twitter Application, Rout. It’s a +F in Fun! 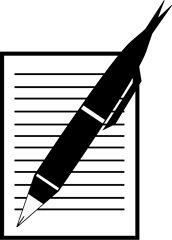 Disclaimer: The “Paper,Write,Pen” clipart above is from OpenClipArt.org. A paper journal yes, but not a private blog. I’m a pretty open book, generally. There’s very little I wn’t blog about,though there are a few things. I’m awful at anything involving physical writing. It’s a tedious process for me. (Has been even before computers.) Thus my idea of making a private, “me only” blog to record my private thoughts. Plus, it’s a lot easier to make sure nobody reads a “me only” blog than a journal which could be found and read by anyone in the house. I used to keep a journal when I was in my teens. I stopped doing it after a while. My blog is kind of a journal of sorts sometimes. I did have a journal. Now I have a private one in Cyberspace. I doubt anyone goes there. I think it is important to have one. I read my Mothers after her death and found out a lot about her feelings. It really made me love her life and want to be more like her. I’ve never kept a private journal or diary. Nah- I’d bore the heck out of myself if I did. Not for some time. I still don’t have a lot of trust with my thoughts so I keep most of them to myself. Since I was young I’ve had paper journals that I would write in. I used to keep a journal when I was younger and sometimes I still write/journal including art journaling with my kids. It’s nice to have a place to vent sometimes! I did when I was younger. It was very helpful for me when I was going through a rough time. I’ve also kept a journal back in grade school and I must say that it’s very helpful in building your communication and language skills. What age did you start writing? Thanks for sharing this twitter app too! A journal is a bit out-dated but it’s still very useful in various instances. I personally have one. Which do you think is better online blogging or writing a journal?